Welcome to our CPD accredited online mandatory training for care home staff package. 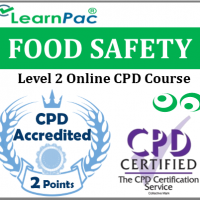 Our online mandatory training courses for residential homes and nursing home staff package was developed in line with the latest UK legislation and meet the requirements set out by the Health and Care Professions Council (HCPC), National Health Service (NHS), Skills for Health’s UK Core Skills Training Framework (CSTF), the Care Quality Commission (CQC), Skills for Care, UK Health and Safety Executive and other professional and regulatory bodies. 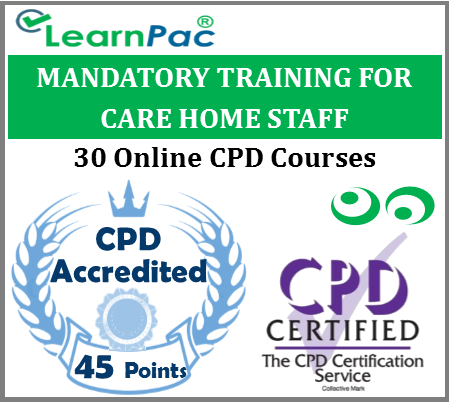 The aims and objectives of this online mandatory training for care home staff package is to enable care home workers to meet their mandatory training requirements in line Health and Care Professions Council, Care Quality Commission and Skills for Health CSTF framework (whether it is induction, refresher training or as annual update). We have developed appropriate mandatory training packages for care home staff to meet the CQC quality standards and performance ratings. Our health and safety training courses for nursing and residential home staff help to reduce injuries and avoid subsequent claims due to negligence and malpractice, improve staff morale, provide safe and effective care and improve patient experience. What is covered in this online mandatory training for care home staff package? Who is the online mandatory training for care home staff package for? At the end of this mandatory training for care home staff e-learning course, learners will be required to complete an online assessment. On successful completion of the knowledge test (80% pass mark), learners will be able to download a FREE CPD certificate that is valid for one year. The content of this online mandatory training for care home staff e learning package has been independently certified as conforming to universally accepted Continuous Professional Development (CPD) guidelines. After adding your mandatory training for care home staff e learning package to the shopping cart (by selecting Add to Cart), you will be able to make a secure payment using all major credit and debit cards. What do residential care home staff do? Many people do not realise the differences between care homes and care homes with nursing, as nursing homes are now called. Both types of home provide accommodation, supervision from staff 24 hours a day, meals and help with personal care needs, but nursing homes also have registered nurses on duty at all times. This means that they can provide care for people with more complex needs and those who need regular nursing interventions. Care homes are staffed 24 hours a day and a proportion of the staff will be qualified care assistants with NVQs (National Vocational Qualifications) at Level 2 or 3. Care home managers are required to have a Registered Manager’s Award or similar management qualification as well as experience in care, but do not need any nursing experience. The kind of assistance with personal care that can be provided in all care homes includes help with washing, dressing, toileting and mobility. Members of staff in care homes often also help residents with eating and drinking, communicating and joining in social activities. They have to keep records of the residents and devise and follow an individual care plan for each resident. What do nursing home staff do? A nursing home will provide all the day-to-day care that you would expect from any care home, but the care is supervised by registered nurses who are on duty all day and all night. People who have an illness or medical condition requiring frequent medical attention will be better off in a nursing home, where nursing care is available 24 hours a day and planned interventions can be carried out at convenient times. Another benefit is that nursing staff are trained to recognise symptoms and changes in a person’s condition, so are better qualified to decide when to call a doctor or other health professional. Nursing homes are often better equipped with specialist beds and a range of equipment for moving and handling people, and are usually the best choice for those who have severe mobility difficulties or who are unable to get out of bed. What is mandatory training for care home staff? Mandatory training is a requirement based upon the responsibility for residential care and nursing home staff to work in a safe manner. The training modules in the mandatory training for care home staff are appropriate in depth to the level of understanding needed. Why do nursing and residential care staff need mandatory & statutory training? 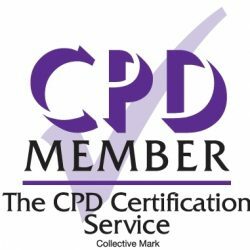 Our accredited online training package for care home helps care assistants to meet the statutory requirements to meet CQC and professional codes of conduct. We are committed to keeping up to date with changes in relevant UK legislation, national directives and requirements on mandatory training programme to ensure that it reflects changing legal, risk and service requirements. 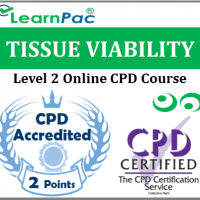 This online mandatory training for care home staff ELearning package was developed in line with the CSTF learning outcomes. Was a great package! It thoroughly went through all the key aspects in an engaging manner. 5/5 would recommend!